Before refrigeration became popular, ice was harvested here at this lake and transported by wagon to Placerville where it was stored in mine tunnels for distribution and use. The old Pearson Soda Works (Cosmic Café, 594 main St.) has such an old tunnel cut into the rock hillside from inside the building that you can tour. This reservoir is owned and operated by SMUD and the USFS, which has four campgrounds connected by trail to Ice House road. 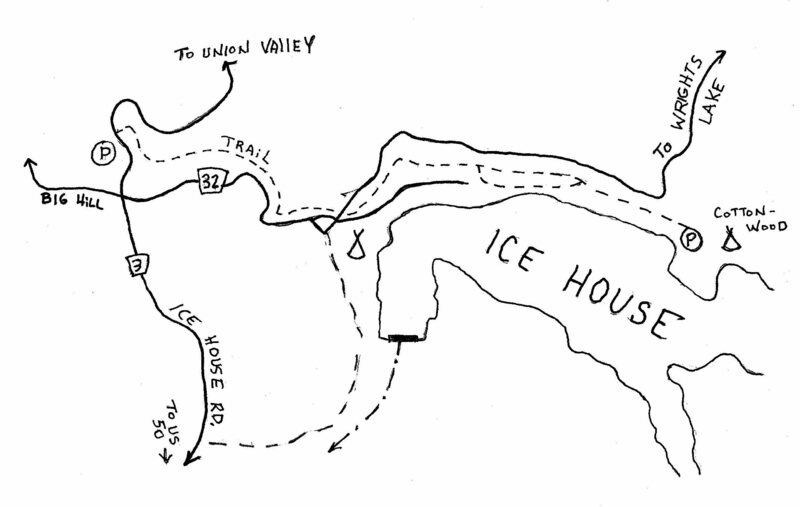 Directions: Go 23 miles east of Placerville on Highway 50 and turn L on Ice House Road. Go 11 miles north and park just past the turnoff to Big Hill (signed and paved). The trail begins on the east side of Ice House Road at a barricade. The trail can be accessed from any of the campgrounds along the north shore of the lake, or from Ice House Road itself, from a parking area just north of the Ice House turnoff (FS 32) along the Left side of Ice House Road. Additional exploring includes the nice waterfalls up Silver Creek from where it dumps into the lake.